I came up on deck around 1915. Sunset. Even though I’ve seen countless sunsets in the last few weeks, this one is still beautiful. The clouds, the water becoming more the color of steel, the sky becoming bronzed. There is maybe half an hour till twilight. The previous watch had calculated it, listing the date and time of twilight on a whiteboard in the doghouse. I was plenty early to the party. So far, there were no stars. Yet. Shortly before Venus appeared (near the moon on the beam of the starboard rail tonight) we passed several sextants onto the quarter deck. One person pulling them out of their cabinet in the doghouse, another (or several people) ready to grab them at the top of the doghouse ladder. It was almost time for a star frenzy. Every time the sun sets or rises, there is a narrow window of time when we can see the horizon when the sun is below it. This is the ideal (and really the only) time you can shoot stars. SEA calls the sometimes chaotic rush to shoot stars during this short period a Star Frenzy. The first time I tried to shoot a star, I’d only seen a sextant once before when my watch officer showed a group of us how to use it. I had no idea what I was doing. I didn’t have a light and it was quickly getting dark out. First, I learned how to find the index error of the sextant I had grabbed, by looking through the scope when the sextant was set to zero and making sure the horizon was a continuous line. The flaws and quirks of each individual sextant need to be taking into account when calculating a star fix, and the index error is the number you use to make this correction. And then the star frenzy began, leaving me in the dust. I struggled to find a single star through the scope and then bring it down to the horizon while my watch officer moved confidently and quickly around deck, shooting star after star. I was impressed and envious. I wanted to be able to shoot enough stars and well enough to give us an accurate fix on our charts. 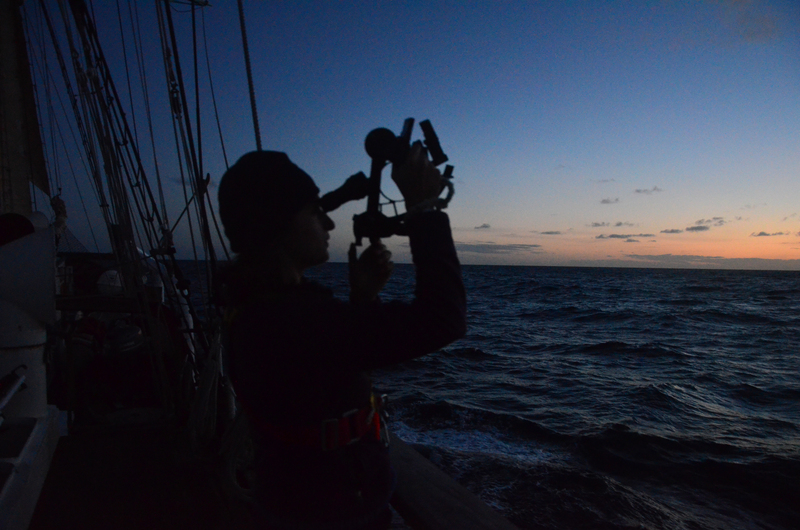 Sextants are a tool that help us to find our line of positions (a line on the globe, somewhere along which we are located) based on the stars we can see and their position in the sky. Specifically, their height above the horizon. You can shoot the sun and the planets, too. “Shoot” being the verb that means essentially, “point a sextant at them to find their height above the horizon and then do a lot of math.” And all the numbers you might need for running the calculations, beside those you got from the sextant, are found in the Nautical Almanac. I’ll be honest, the math is beyond me. Conveniently, there is a program on the boat that lets you plug in the position of the celestial bodies you shot and the exact date and time you did so, and it will churn out your location. 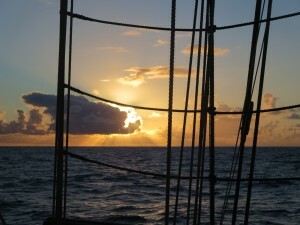 We were to rely on celestial navigation and dead reckoning to get us from Suva to Auckland. Night after night (and morning after morning) we shot the stars at twilight. When I joined a star frenzy one evening, it was the first time I’d done so since the very start of the voyage. I’d been left befuddled and confused that first try. But this night, I got the hang of it, shot five stars or so, and ended up getting a star fix within 3 nautical miles of accurate. Which is a very good fix. And to think, just a couple of weeks previously, the sextant had been a stranger to me. But now I was hooked. I made a point of shooting the stars whenever possible. Sometimes staying up a bit later than I should learning how to use the computer program. And though I never got a fix as good as the 3 mile one, I started to get just a bit more familiar with the stars: Altair, Antares, Rigel Kent, Achernar, Alpheratz, Deneb. All spinning slowly through the southern hemisphere night sky. Orion and Scorpio chase each other. Venus and Mars shine brightly. And they watch us glide along, guiding us further south. This entry was posted in Uncategorized on November 20, 2016 by Paige. Holy Mackerel, I LOVE this!